Nonho I am getting weary of your evasiveness and satellite 'hugging'. Now answer the questions I put to you. 1. You claim to see lights traversing the sky. Have you seen these lights traversing the sky in the middle of the night? When the sun is directly on the opposite side of the Earth? Lights in the sky which do not skirt the sunrise or sunset? How is it possible that something in the EARTH'S SHADOW can be lit by the sun?? ?>?Tell me???? Why don't you say that you only see these lights at sunset or sunrise?? Constant light and constant distance give me my 'X' please. 3.Your claims regarding satellites fall under the 'observational selection' fallacy argument. You see a very limited selection of 'lights' in the sky and without knowing exactly what they are harp on in a stubborn way about them being 'satellites'. You man do not know what these limited lights are ( there are 6500 claimed satellites in 'space') and give no reason as to why all the other claimed satellites are invisible to human eyes. Terence.drew, cool down please. I feel like I am reading your words as very hot and angry. I want those questions answered too, but let's not resort to calling people "evasive" here. Sometimes it takes a while for people to get around to answering a question. Let me take a stab at it. 1. Do the satellites have mounted lights on them? This would explain their bright star-like glow as they travel across the sky. It would also explain why the lights do not dim - it's not a reflection that is momentarily reflecting the distant sunlight but some kind of fast-moving object with a light on it. 2. This seems to be two questions. I think nonhocapito gave a good suggestion as to why there may not be that many satellites. If you take 10,000 satellites and assume they are all moving and equidistant, and divide that by square km of the Earth (510,065,600 km²) you have one satellite every 51,000 km². How many km of stratosphere can we see from a position on the Earth? Probably quite a lot, but 225km across? That's how wide an area we'd have to see to get close to that 50k of square kilometers. Now imagine there aren't 10,000 satellites; there are only 6,500. I can imagine that one per hour might be the amount I would see in a given night. I am not sure. The second question - about if they would be visible - if they are very small - from so far away is very valid indeed. Either it must be a very bright "reflection" or light source, or the objects must be quite large. Remember that a balloon floating up very high tends to disappear from our vision before it pops. The sheer fact that the satellites are visible at such incredible heights is interesting. Can they be very high airplanes? This would explain the bright lights and their fast motion. 3. Okay, cherry-picking may be occurring here, but let's remember we are challenging typical notions of what is in the sky. Instead of arguing with one another as much, let's focus more energy on gathering scientific data about these things and reporting back to one another. I think it will be fun. Let's get telescopes and then nobody will assume they are satellites and nobody will assume they aren't satellites. Let's observe and take note and report back. Okay? Terrence.drew wrote: Nonho I am getting weary of your evasiveness and satellite 'hugging'. I won't pick up on this hilarious "satellite hugging" "insult". It's just a way to make this a dividing issue. So you are getting weary, what should I do, cry? If you are a researcher, act as one. If you are a bully, go talk to someone else. I've said all I know about artificial satellites already, which isn't much. Certainly the truth about them is more complex than we know, but so far your arguments do not hold. Sorry. Once again: It is reasonable to see that many satellites per night (considering that the calculation Hoi tried is for the surface of the earth, but the surface the orbits cover is much wider), and it is reasonable to see them in the dead of night, since they can be high up enough to catch light from the sun. Sun light is not like that of a spotlight. Try with a ball and a lightbulb, and see how far your finger has to get from the ball before it gets illuminated. Just consider that the satellites I can see will be the ones out of the shadow. Not so difficult. As I said: I don't live at the equator. I live in the northern hemisphere. Shadows at noon in Italy are longer than at the equator because the sun is NEVER directly high above, which means it is also NEVER directly behind us at night. I've seen those lights at two in the morning like at 10 at night, it doesn't really matter the time. As to Hoi's questions... could these objects have a light source on them? They seem to be flying much much higher than planes, any light source up there would have to be so incredibly powerful to get to us, and for what purpose? It is interesting to wonder why the light we see is so steady. Should it flicker? Should it dim? My bet is that if we could follow it with a telescope, we probably would see it flicker. But with naked eye, the flickering is lost. The light coming from planets is reflected too, but at night we don't see it dimming or flicker with the naked eye. Star lights do flicker, reflected lights look steady. This general rule makes planets so recognizable, no? In the darkness of sky, if the object is catching light from the sun, I guess it will just look very bright and not flicker. Anyway I don't think we are following a correct approach. Instead of jumping so far ahead pretending to prove the whole science is bogus, why don't we focus on single stories like Hubble's or Sputnik's and see if they hold up to scrutiny and we move from there? The ultimate revelation might be that lots of what we know about satellites is wrong, but I think it takes much more research to get there. 'Satellite hugger' are the wrong words here but I meant it in the following context. Like the 'planes' in 911 tale, none of us has actually 'seen' satellites. Lights in the sky are lights in the sky. I just wish to get to the bottom of this. NASA is top of the mind fiddler list. Well assumptions can't be made that the world is spherical. In fact, there is nothing to prove that it is spherical and moving on its axis. If it were a sphere moving on its axis, a 12 hour hot air balloon trip with vertical movement alone would take you half way around the world. Go up, 12 hours later come back down on the other side of the world. The world is not a sphere moving on its axis! chuck22 wrote: Well assumptions can't be made that the world is spherical. In fact, there is nothing to prove that it is spherical and moving on its axis. If it were a sphere moving on its axis, a 12 hour hot air balloon trip with vertical movement alone would take you half way around the world. Go up, 12 hours later come back down on the other side of the world. The world is not a sphere moving on its axis! So the earth is flat? And where the sun "goes" at night? Why it comes back on the other side in the morning? Where are the boundaries of the flat earth? Who lives there? Do you know that people travel around the world all the time, going in one general direction all the way and getting back to the place they came from? (I've met some of those, they were no Magellans, but they got back home all right!) Why when it is night in italy it is morning in India or Australia? All the maps we use are correct, in every country, and they all work together. In which countries, in which locations exactly the maps start being wrong and start hiding the flatness of the earth? Maybe Afghanistan? How are the seasons explained? How the tropical climates? How the change in length of the days? Etc etc etc. The idea that the "dark ages" believed the earth to be flat is a myth created around Columbus epic. There were no "dark ages". Just categories of people stubbornly promoting superstitions, in every age (and sometimes they prevailed). Humankind have known for a long time that the earth was spherical: by simply observing the world around them, without telescopes or satellites. As to your argument of the balloon, there isn't much to be said. If you reasoning was right, you wouldn't even need a balloon, just by jumping up you would travel. But hey, come to think of it, when you're on a plane, or a train, or a bus, how come you don't travel back when you jump? Ah, mysteries! One thing is looking at the world with innocent eyes. Another to look at it with eyes unwilling to learn. The air around the Earth has spin - just like the Earth does. Weather patterns are also created by the spin of the Earth. Most importantly, we are born with velocity and we die with velocity. If we suddenly stopped in an absolute universal position, we would "fly" away from the Earth, the solar system and the galaxy. Or rather, they would "fly" away from us. Thankfully, it is not easy to do so. It's true that the Earth isn't spherical - it's more oblong - but I assume chuck22 is being sarcastic when he even brings this up. The successor to the Hubble telescope, the James Webb telescope, has been axed on the 6th of July. (for the moment). NASA get funding for a project. It gets delayed. They get more funding. It gets delayed. They get more funding. The James Webb is a classic example. What started out costing 1.5 billion has since bloated to approx 6.5 billion, and it looks like it will not even be launched until 2018-2020! If this decision stands to axe this thing fair play to the American Congress, perhaps they are coping on to NASA scamology. 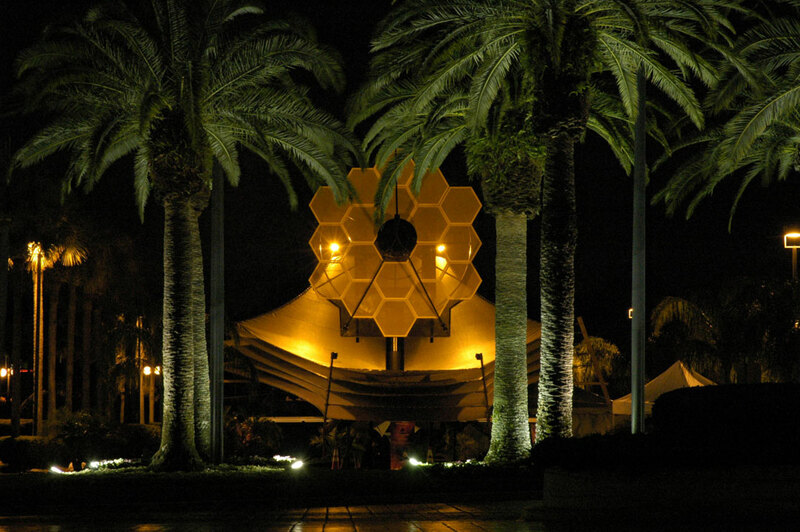 So what is the James Webb Telescope? It was meant to be a super-duper multi-spectrum telescope orbiting a million miles from the earth with the Sun completely blocked out due to its far out orbit. Its peculiar design involves heat shields to block out any further radiations from Sun or Earth, and so it would sit in the deep freeze, picking up traces of every tiny glow out there that ever existed. It is named after James Webb, NASA administrator supremo who was at the helm of NASA during it's golden period 1961 - 68 when it's budget was bigger than many US states. The Hubble telescope was named after Edwin Hubble the American Astronomer. James Webb's middle name is also called 'Edwin', which comes from the old English 'Ead' and 'wine' meaning 'rich friend'. These two men also have the connection of belonging to secret 'Fraternities'. Edwin Hubble was a member of the Kappa Sigma Fraternity and James Webb was a Freemason from the University Lodge - No. 408, Chapel Hill, North Carolina. 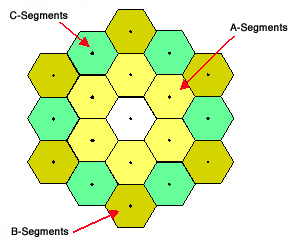 The James Webb telescope has a central core of 6 golden mirrors surrounded by 12 more. This big 666 in the sky (symbolically), in a position where the Sun is eclipsed by the Earth, is literally dripping with occult symbolism. Much esoteric thought is based on the idea of a gyre or a spiral, which starts from a point and has an expanding orbit above it. You are born and pass through each point in the Zodiac but from a higher point each year. Space crafts take off from a point and reach ever higher orbits. Are NASA dark occultists? Given the amount of symbols, numbers, dates, name references and deceptive practices employed by said organization, I would suggest that occultism forms the central core of it's being. Objects supposedly orbiting the Earth are 'boundary-less'. This is what is put to us. But - As above, so below. Back on Earth, this 'boundary-less-ness' has played an important part in the corporate take over of the Earth's resources. No countries, no boundaries, just resources to be taken at will and by force or banking hoax if you do not comply. It's a subtle thing but I think it is worth mentioning. I was reading on a forum (either on Nukelies or Letsroll) that the Hubble telescope is allegedly 'short sighted'. This stems from people asking that the great telescope be turned on the moon to see the sites of the moon landings. The answer as to why the images come out somewhat fuzzy is that it was designed to see things very far away and not close! So it is different in design to a normal telescope? My own experience from this comes from living in my once home Prague. There on the hill is (or used to be anyway) an observatory. We went up to see the stars one night but it was cloudy. The good fellow in the dome swung the telescope around and focused perfectly on the light bulb from the shop over yonder on the hill. Could any telescope pick out smallish detail from even a fraction of that distance? Could a telescope in London see a Lorry in New York (imagining that the Earth is flat nice one Chuck!) Its doubtful. Even still, the spin about short sightedness was put out there. on a bunch of baking flour. ..."its beyond what we can comprehend!" I watched a "documentary" way back in the day when they "replaced" the original Hubble Lens - that "took shots" approx 12x12 pixels.
'' 1.First law: The velocity of a body remains constant unless the body is acted upon by an external force. the hubble has to be in motion at in a constant speed all the time..... otherwise....it will fall down to the earth. Am l saying something stupid here ??? the only way is to get the hubble a independent propulsion system who is able to maintain a constant speed of app.17 000 mi/h. ''simonshack''We already know that Hubble has no thrusters. Shouldn't we learn more about the thrusters which all other satellites must be equipped with? And how these thrusters operate (supplying directional propulsion) in the vacuum of space? how about the moon ??? how about the earth ??? this is serious matter here..
the moon circling the earth ??? Let's leave that for tomorrow, ok? First, we have to destroy the credibility of the hoaxers of this damn world. Today.